This week was very quick. We didn't even have a color this week. Today, was picture day, so, we didn't get much done today either. On Tuesday, we had our annual fall nature hike at a local park. We were looking for leaves, nuts, squirrels,...anything to help us identify fall. Along with the items listed, we also found, ducks, mushrooms, worms, slugs, daddy longleggers, and roly polys'(I'm sure these are not the scientific names, but they work well for us). So we found lots of great things and filled our bags to the brim--Now what? I let my children take their bags home, but I have a couple of thoughts on what to do with those special items found on a fall nature hike--sans the bugs. I'll post one today. First of all there are a variety of leaves with a variety of colors. Something one can do is glue them to a piece of paper and write their tree names next to them for identification. 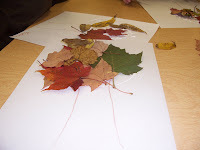 We made a fall tree with our leaves. I collected many leaves and pressed them for a couple of days between some newspaper. Then at school I spread the leaves on the table. I traced the children's forearm and fanned fingers to make a tree trunk and branches--usually I have them color this brown, but we ran short on time today. 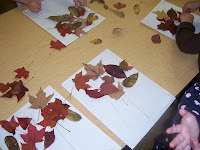 Then I spread glue all over the tree top and told them to add some beautiful leaves to make a fall tree. This project is somewhat new this year. 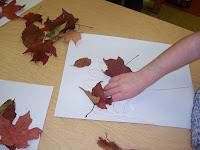 I have always made a fall tree using the children's forearms, but we always added foam leaf shapes. Last year, my son made a collage of leaves at home and hung it in his room--after three months, the leaves still had their color. So...I thought this year I would make the trees with real leaves. I hope they keep their color. I thought they turned out neat though. I read a new book this year that was quite fun for the children. 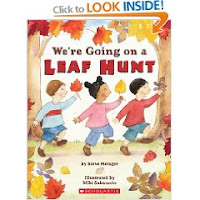 The book is called "We're Going on a Leaf Hunt, " by Steve Metzger, illustrated by Miki Sakamoto. It is very similar to "We're Going on a Bear Hunt." The children in the book are looking for leaves. 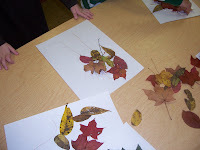 They travel over, under, and through and find different kinds of leaves. This is a book where the children participate. They climb--huff,huff--they go through a forest-step,step, etc. It also does leaf identification. After each jaunt they find a leaf and tell you what type. We had fun with this. Love your site! So glad I found it!! So many fun ideas. Leave that MOVE when Tickled? Another great kid- friendly activity your readers would enjoy is to grow a TickleMe Plant from seeds and then watching the plant MOVE when Tickled! As a first grade teacher I no longer plant Lima beans, as the growing of this interactive plant, proved to be much more exciting and educational for my student's. Cute!! I am going to try to find that leaf book. 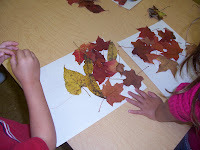 My boys and I have pressed fall leaves between clear contact paper to make placemats and pictures to hang in the window. Will have to try the tree...neat idea.